The S-Leah class canal boats. There is full radiator central heating on the boat. Also a cosy Woodburning stove in the saloon . A 200 gallon water tank supplies the hot and cold running water. There is carpeting on the cabins and saloon. 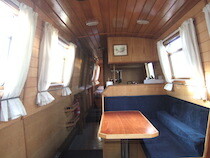 Saloon with sofa which converts to a double , and removable table , in the bow of the boat. Woodburning Stove. Radio/CD player; colour TV/DVD player. There is a bathroom with a wash hand basin, electrically operated flush toilet and shower and a 240v shaver socket . 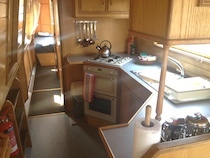 A welcome pack is provided, consisting of washing-up liquid (x1); scourer (x1); dishcloth (x2); tea towel (x2); floor cloth (x1); toilet roll (x4) and bin liner (x 3); kitchen roll(x1) ; hand wash. 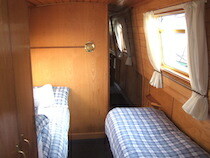 Tuition, and buoyancy aids, are supplied free of charge, as are helmsman's waterproofs and an umbrella.